Everyone knows about the incredibly efficient Toyota Prius. Using hybrid technology, the Toyota Prius sets the bar when it comes to efficiency, but what you may not know about is the Toyota Prius Prime. The 2019 Toyota Prius Prime takes the Toyota Prius’ fuel-saving technology a step further as a Plug-in Hybrid Vehicle! The 2019 Toyota Prius Prime is the perfect car for those who are looking to step into the future of automotive and become even more independent from gasoline than the Toyota Prius. With its aerodynamic design, advanced hybrid technology and an array of interior features, the 2019 Toyota Prius Prime is everything drivers could want in an efficient car! If you’re looking to learn more about the 2019 Toyota Prius Prime, you’ve come to the right place! In this model research page, we’re going to break down everything drivers need to know about the 2019 Toyota Prius Prime from its efficiency to its features and more! Let’s see what the 2019 Toyota Prius Prime has to offer! 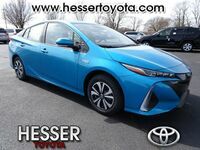 Test Drive the 2019 Toyota Prius Prime at Hesser Toyota in Janesville, Wisconsin, Today! The first thing that drivers will notice when they look at the 2019 Toyota Prius Prime is its sculpted and aggressive look. It doesn’t look like any other plug-in hybrid! The 2019 Toyota Prius Prime’s design isn’t just for style either, it also has aerodynamic features like an active front grille shutter, underbody covers, side body fins and exclusive dual-wave rear glass design. The design makes for a faster and more efficient ride! Of course, though, what drivers really want to know about the 2019 Toyota Prius Prime is its efficiency. Thanks to 2019 Toyota Prius Prime’s hybrid plug-in technology, drivers can get up to a manufacturer-estimated 133 MPGe. That adds up to a total driving range of 640 miles! Plus, the available Predictive Fuel-Efficient Drive monitors your driving habits and will even recommend ways to drive more efficiently so you get the absolute most out of your fuel costs! The 2019 Toyota Prius Prime is here to save you money! If you’re new to the plug-in hybrid segment and are unsure of how it works, don’t worry! The 2019 Toyota Prius Prime makes things easy with an available charging cable lock for public charging stations, and the at-home charging cable is included so you don’t have to worry about it! Plus, the 2019 Toyota Prius Prime can get a full charge in less than five-and-a-half hours, and you can set it to charge during off-peak electricity hours so you can save money on that too! Want to learn more about the 2019 Toyota Prius Prime? Ready to get behind the wheel of one? Contact our staff at Hesser Toyota for more information or to schedule a test drive today!